It is easier to start with what Townshend is not. 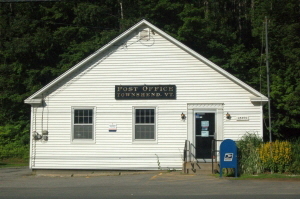 Townshend is not a Manchester with acres and acres of paved parking lots and scores of “factory outlets”, nor is it a Woodstock with lots of small businesses clustered around the town center. Matter of fact, when it comes to what one would expect as a “business district”, that being the center of town, Townshend has a pizza place that was fully renovated yet never opened, much to everyone's dismay, and, the way things are going, probably never will. Once upon a time (in the last 40 years or so) there was a hardware store and a pharmacy as well as what was known as “The Corner Store” which was in the building that now houses the pizza place. The credit union that was in the old hardware store has moved down the road a bit and the building that housed it is now all apartments. There are several private residences as well as at least one bed and breakfast plus some other “establishments” that may or may not be businesses in “downtown Townshend”. Hard to tell at times to be honest. Ask anyone in Townshend if they want to be a Manchester and one will likely be told, “NO!”. Ask folks if they would like to be a “Woodstock” and one would get more varied opinions. However, silver linings being what they are, what you do get in Townshend, in the center of town, is a glorious place to stop and take pictures of the center of an ideal New England town, just like the old days for the most part. Does anyone wander around Manchester taking pictures of the factory outlets aside from “selfies” amidst all the merchandise? One thing we can say is that our town center was in “Funny Farm” and Woodstock and Manchester were not. 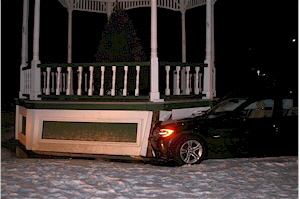 Funny Farm's most noticeable “gift” to Townshend is the gazebo on the Town Common. This gave the voters something relatively new to argue about at Town Meeting, on occasion, instead of items that dated back to the 1960’s and earlier. As fate would have it, the "controversial" Townshend Gazebo propelled Townshend into the national spotlight early in 2016 because a "slightly intoxicated" individual from Connecticut and his sober cat decided the gazebo should be a drive through. No, regrettably, the cat was not the designated driver. Who would have ever thought that a movie prop would really put Townshend on the map some day? Said individual took a very difficult path across a traffic island, through/over a stop sign, across the common itself, and parked his BMW in the base of the structure leaving numerous BMW bits and pieces along the way. The news media was all over it and, all of a sudden, it became the "Chevy Chase Gazebo" (no one here had ever referred to it as that). Associated Press picked up the story and it was in virtually every newspaper in the country, both print and on line. Lest you think this simply is a "new" old folk tale, just Google "Chevy Chase Gazebo Townshend VT". Photo credit goes to the Vermont State Police. Townshend had to file in court against Amica Insurance to get full reimbursement for the damage done. Now, doesn't that just add a bit more to the plot? All recent news aside, lest the visitor gets the wrong impression, Townshend is alive and thriving from a business standpoint. Just because the businesses are not clustered in the middle of town does not mean they don't exist. Businesses are all up and down Vermont Route 30, up in the surrounding hills, and nestled into the cracks and crevices of the landscape. That credit union, they did not leave town, they just moved about a mile south. The community is bustling in so many ways, it just takes a bit of sight seeing to recognize it. But, again, it leaves us with that beautiful center, unspoiled by commercial ventures. It could be parking lots and factory outlets. The people of Townshend are creative and they use what space they have to add to the economic viability of the town. Agriculture in Townshend is hardly dead either. It used to be all dairy cows but hardly a dairy cow can be seen now. Horses, goats, beef cattle, even emus roam the landscape in a larger sense, well sometimes they are not intended to “roam” quite as far and wide, and small agricultural operations of all kinds abound. Townshend’s economic base is quite diverse, a little agriculture, a little manufacturing, some in the construction industry, some in automotive, and many other ventures way too numerous to mention. The major employers in Townshend would be the two schools, Mary Meyer Toys, and Grace Cottage Hospital and its extended facilities. The remainder are small firms with a handful of employees and many sole proprietor type businesses. An interesting point is that Townshend’s population has barely doubled since 1791. It has gone up and it has gone down but the current census figures aren't much different from the peak in 1860. (Vermont Historical Society). Townshend has issues which do make it difficult to “expand”. Much of the property is mountainous, steep, and almost solid rock. House sights are difficult to find, especially if one is not willing to put enormous sums of money into waste water disposal. The State and the Federal Governments control a large amount of acreage because of the State Park and the Townshend Dam and Recreation Area. The amount of property in Townshend that is not owned by residents hovers around 50%. Much of this is considered “investment” property though second homes are quite numerous. If one comes to Townshend to visit, and it is a worthwhile stop on your journey up Vermont Route 30 and the beautiful West River Valley, plan to stay around for a time, take pictures of the beautiful Town Common, and explore the many creative enterprises, both those along the main road and those in the hills and the valleys well off the Google Car track. With any luck, you might get a glimpse of an unintentional free range emu. The good people at WCVB, Boston’s Channel 5, came up and explored bits and pieces, some on the Google Car track, some well off it. In Chronicle's “New England Main Streets and Back Roads” series you will find these wonderful pieces that will help you discover a bit of Townshend. Spend a bit of time watching the various segments of the show. A big thank you to WCVB! Note that these may take some time to load based on your connection speed.